...or Normal Fudge. Eaten by Zeus himself (the God not the wrestler). This is what fudge is. The classic recipe and the proper techniques. Handmade using fresh whipping cream and all natural ingredients and no preservatives. 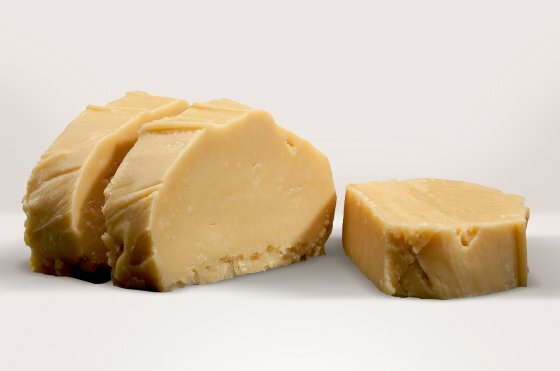 Dairy Free fudge is ideal for fudge lovers who are lactose intolerant, have a milk allergy, are vegan, or are on a special milk free or dairy free diet. All our hand made fudges are also gluten free. Sugar, Water, SOYA Milk, Glucose Syrup, Inverted Sugar, Handmade Caramel (2%), Dextrose, Salt. For Allergens, see in BOLD. Not suitable for Nut and Peanut allergy sufferers due to manufacturing methods. Free From artificial flavouring and colouring. Gluten free. Vegetarian friendly. Vegan friendly. Keep in a dry, cool place away from direct sunlight. Our whipping cream fudge is freshly made and should keep for up to 10 days, but whether you can wait that long is another matter. Store your fudge at room temperature, as the sugar in the fudge acts as a natural preservative. DO NOT REFRIGERATE it, as this can affect the colour and texture of the fudge. Humidity and sudden changes in temperature may affect the firmness of your fudge. Loved it! so rich and creamy, just melts in the mouth. hard to believe it is dairy free. Really good value the person who I bought it for enjoyed it that much he didn’t tell his wife it had arrived he ate it all h8mself before she got home. This was melted when it arrived. Thank you for an awesome fudge making experience today. We had a fantastic time. Thank you for making us feel so welcome. We shall be recommending it to all our fudge loving friends!!! Thank you for an amazing fudge experience today :-) we both thoroughly enjoyed ourselves and are overwhelmed by the generous helpings of fudge we got to take home with us!!! Another great visit today ???? gotta say your staff are fab and loved the vegan coconut fudge!! Keep it up! Gregg says: If you’re a fan of fudge, the Fudge Kitchen has an amazing selection of products. I love a bit of a clever cheat when it comes to summer desserts and this indulgent sauce is great. Literally the tastiest and smoothest fudge I have ever eaten! It's sublime, especially with the amount of flavours! I've just ordered 2 boxes of 6 blocks now, only a week after ordering a 6 block box. Best fudge in the world. I wasn’t keen on fudge in the past. Mainly because I am lactose intolerant. Then I tried Fudge Kitchens dairy free fudge. It so delicious and moreish. Really doesn’t last long in this house. I found the staff in the Bath shop extremely friendly and the fudge I tried ie dark chocolate and the newly made batch of white chocolate absolutely out of this world best fudge evet !!!!!! I watched the lady make the white fudge finding the process absolutely fascinating , making sure all my friends and family see it. Bought 4 slabs for £17 and was well worth every penny !!! Unbelievably delicious fudge - highly recommended. Found thjs marvellous shop in Bath, tried a piece and have been hooked ever since. Every time we visit Bath, we buy a box. 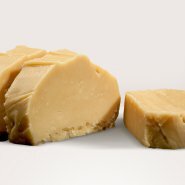 Thrilled to be able to order online because this fudge is quite simply, the most gorgeous and delicious fudge I have ever had. I'm not tradionally a person who likes fudge but ALL the fudges in offer here are addictive. Simply divine. Amazing fudge, we received some in a hamper and then bought more ourselves straight away! Best fudge ever. My son bought me a box of 6 different flavour slices for Christmas. I can't believe how creamy and tasty it is. Shall definately be visiting the shop and buying more. The person I bought the 12 Flavours of Christmas box for told me today that it was the best fudge he’d ever tasted! I don't know whether it was the super friendly staff, the calming demonstration of the fudge being made, the extremely helpful guy at the till or the creamy melt-in-the-mouth vegan sea salt caramel fudge itself, but these guys are amazing! Thank you for turning my bad day into a great one! We were on a street food tour late Dec when we puchased our box of fudge and traveled all the way back to Australia with it. Wow last piece last night. Still as good as the first day. Enjoyed the experience watching the guys demonstrating the art of making Amazing Fudge. My mum, daughter and I visited the shop on Tuesday 19th of December and was just blown away with the friendliness and enthusiasm that the 4 lovely guys showed. The fudge tasted amazing and the flavour choices were great. The highlight for me was the beautiful version of happy birthday they sang to me! It made my day. Thank you so much for that great experience and we shall with out a doubt be back! AMAZING customer service from the team! Fun friendly and lots of tasting opportunities offered! Fascinating watching the fudge being made!! Cannot recommend enough and oh by the way the fudge is delicious!!! I received a fudge kitchen selection as part of a Christmas hamper and loved every last bit! I have purchased some as a gift on this occasion knowing what a treat it was to receive. It’s delicious, creamy, and worth every penny. Without a doubt the best fudge shops around! I only found them by accident following a day out in Oxford. The staff are amazingly friendly, always offer you a sample before you make your selection! The fudge itself is so creamy and melts in your mouth and the flavours are perfectly crafted, keep up the good work!